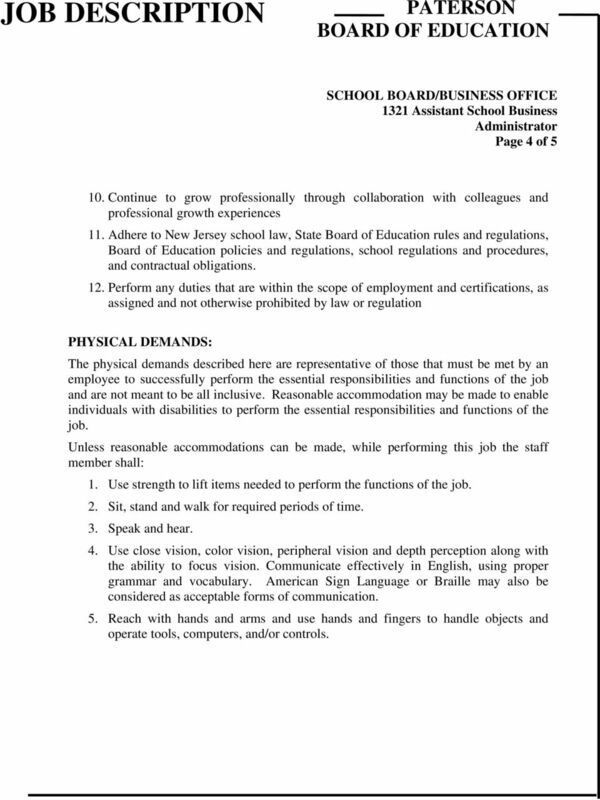 Download "JOB DESCRIPTION PATERSON BOARD OF EDUCATION. SCHOOL BOARD/BUSINESS OFFICE 1321 Assistant School Business Administrator Page 1 of 5 REVISED"
1 Page 1 of 5 REVISED JOB TITLE: REPORTS TO: SUPERVISES: ASSISTANT SCHOOL BUSINESS ADMINISTRATOR School Business Business Operations personnel as requested by School Business NATURE AND SCOPE OF JOB: The Assistant School Business assists the School Business in administering the business affairs of the district to provide the most audit-compliant, cost-effective and efficient services with the resources available. QUALIFICATIONS: The Assistant School Business shall: 1. Hold a Bachelor s degree in accounting or business from an accredited college or university. 2. Preferably have a minimum of three years of experience in public school business operations or public school accounting, including at least one year of experience in a supervisory capacity. 3. Have a valid state certificate to practice as a School Business. (A letter of eligibility may be acceptable.) 4. Demonstrate excellent initiative, personal integrity and business ethics. 5. Hold a valid driver s license with no serious violations. 6. Exhibit positive interpersonal skills to relate well with students, staff, administration, parents, and the community. 7. Demonstrate the ability to communicate effectively and concisely in English, both orally and in writing, using proper grammar and vocabulary. 2 Page 2 of 5 8. Demonstrate the ability to use electronic equipment for work processing, data management, information retrieval, visual presentations, and telecommunications. 9. Provide proof of U.S. citizenship or legal resident alien status by completing Federal Form I-9 in compliance with the Immigration Reform and Control Act of Provide evidence that a criminal record history check has been conducted and clearance has been given by the Department of Education. During the initial six month period provide a sworn statement that the individual has not been convicted of a crime or a disorderly person s offense in accordance with 18A: Provide evidence that health is adequate to fulfill the job functions and responsibilities with reasonable accommodation pursuant to 42 U.S.C and in accordance with N.J.A.C. 6:3-4A Pass the state required Mantoux Intradermal Tuberculin Test as required by N.J.A.C. 6:3-4A Meet such alternates to the above qualifications as the Superintendent may deem appropriate, acceptable and legal. VERIFICATIONS OF COMPETENCY: 1. District application and resume. 2. Documentation supporting qualifications outlined above. 3. A minimum of three letters of reference from former employers or other professional sources, and/or copies of recent performance evaluations.. 4. Official College Transcripts. 5. Employment interview. 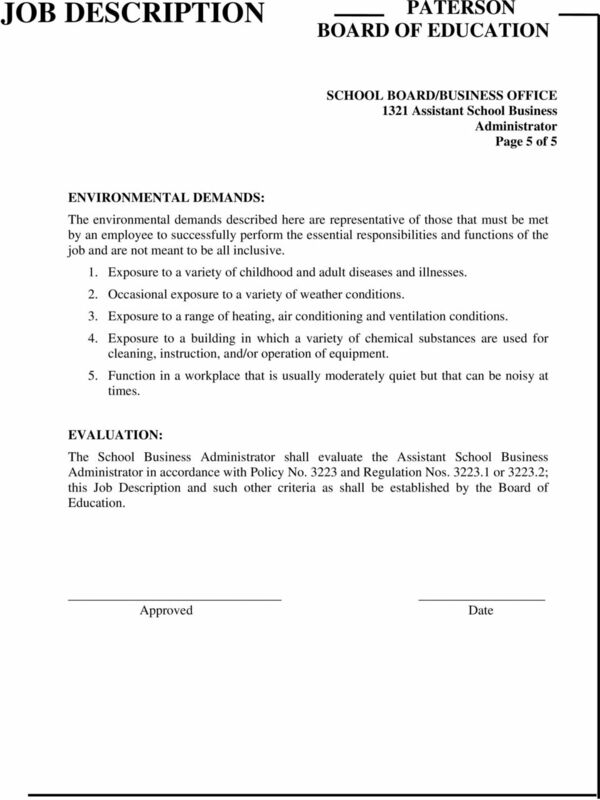 3 Page 3 of 5 EMPLOYMENT TERMS: The Assistant School Business shall be employed under the following terms: 1. Work year of twelve months. 2. Salary or hourly wage, benefits, and leave time as negotiated. 3. Conditions established by laws and codes of the State, and policies, rules, and regulation established by the Board of Education (N.J.S.A. 18A:27-4 et. seq.). 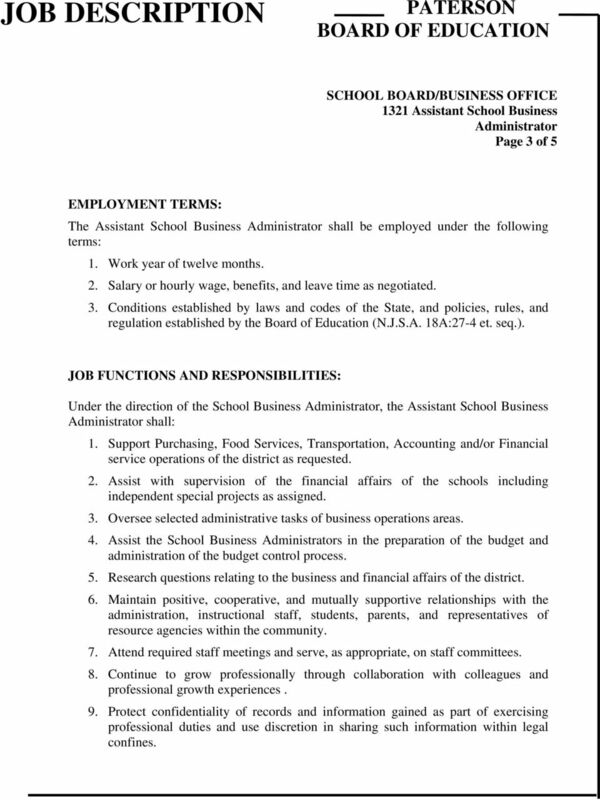 JOB FUNCTIONS AND RESPONSIBILITIES: Under the direction of the School Business, the Assistant School Business shall: 1. Support Purchasing, Food Services, Transportation, Accounting and/or Financial service operations of the district as requested. 2. Assist with supervision of the financial affairs of the schools including independent special projects as assigned. 3. Oversee selected administrative tasks of business operations areas. 4. Assist the School Business s in the preparation of the budget and administration of the budget control process. 5. Research questions relating to the business and financial affairs of the district. 6. Maintain positive, cooperative, and mutually supportive relationships with the administration, instructional staff, students, parents, and representatives of resource agencies within the community. 7. Attend required staff meetings and serve, as appropriate, on staff committees. 8. Continue to grow professionally through collaboration with colleagues and professional growth experiences. 9. Protect confidentiality of records and information gained as part of exercising professional duties and use discretion in sharing such information within legal confines. 4 Page 4 of Continue to grow professionally through collaboration with colleagues and professional growth experiences 11. Adhere to New Jersey school law, State Board of Education rules and regulations, Board of Education policies and regulations, school regulations and procedures, and contractual obligations. 12. Perform any duties that are within the scope of employment and certifications, as assigned and not otherwise prohibited by law or regulation PHYSICAL DEMANDS: The physical demands described here are representative of those that must be met by an employee to successfully perform the essential responsibilities and functions of the job and are not meant to be all inclusive. Reasonable accommodation may be made to enable individuals with disabilities to perform the essential responsibilities and functions of the job. Unless reasonable accommodations can be made, while performing this job the staff member shall: 1. Use strength to lift items needed to perform the functions of the job. 2. Sit, stand and walk for required periods of time. 3. Speak and hear. 4. Use close vision, color vision, peripheral vision and depth perception along with the ability to focus vision. Communicate effectively in English, using proper grammar and vocabulary. American Sign Language or Braille may also be considered as acceptable forms of communication. 5. Reach with hands and arms and use hands and fingers to handle objects and operate tools, computers, and/or controls. 4. Hold other such credentials or alternatives to the above found to be acceptable equivalents. 2. Have five years of experience at processing maintenance work orders in a multi-property facility in the ranger of 2,000,000 sq ft. Perform service for clients and customers as requested in the form of service tickets, service projects, and research. Position Description: Member Business Services, Commercial Loan Officer Department: Member Business Services Division: Lending FLSA Status: Exempt Location: Syracuse Revised: February 2015 Purpose: I.
Pasadena Area Community College District Employment Opportunity CALWORKS DIRECTOR Academic Management 100%-11 Months #104 Exempt Position: This is an exempt position and is not subject to overtime pay. 2. Provide timely response to customer problems; serve as the lead person for troubleshooting escalated server issues and systems issues. DIRECTOR OF HUMAN RESOURCES Thriving non profit healthcare organization is seeking a dynamic individual for Director of Human Resources. We are a team oriented, fast paced, forward thinking organization. 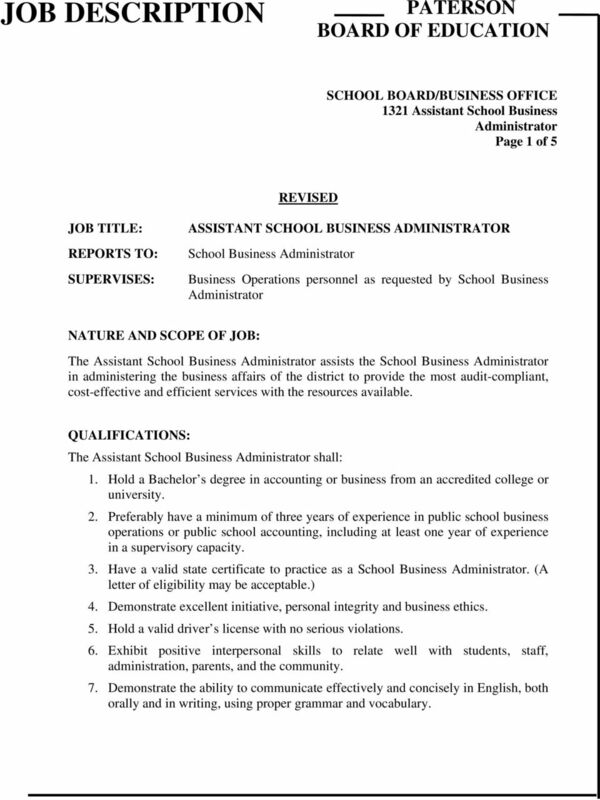 1320 DUTIES OF SCHOOL BUSINESS ADMINISTRATOR/ BOARD SECRETARY. 1. Valid New Jersey School Business Administrator Certificate. 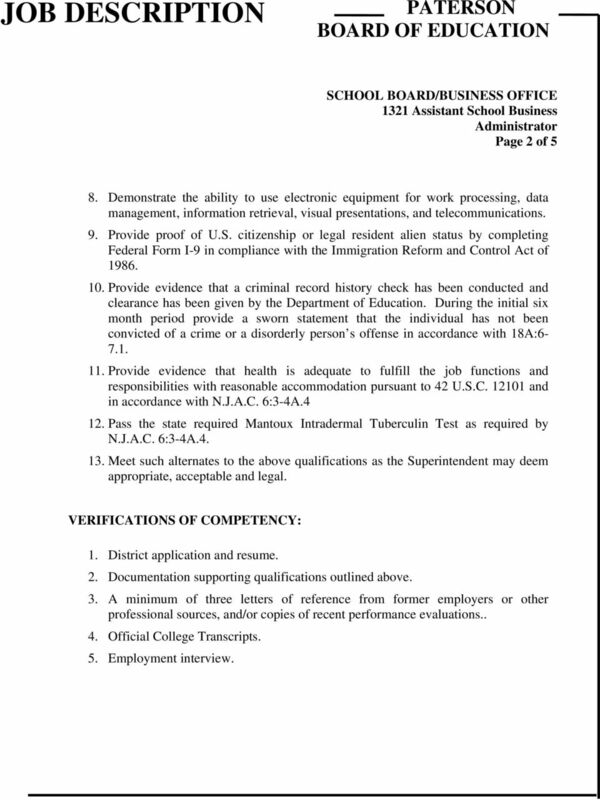 1320/page 1 of 5 Qualifications 1320 DUTIES OF SCHOOL BUSINESS ADMINISTRATOR/ BOARD SECRETARY 1. Valid New Jersey School Business Administrator Certificate. 2. Minimum experience as determined by the Board. This position, which reports immediately to the Program Director, is one-year grant funded initially, full-time, salaried, exempt, and with benefits. Multiple Subject California Credential and be NClS compliant. Job description attached. See attached.